It was quite a day for thousands of BJP supporters who braved rain and snow to attend the election rally of their party president Rajnath Singh here today. It was another matter that Rajnath Singh missed his date, though he did not fail to address his suppo- rters in a novel way. 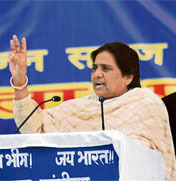 BSP chief and UP Chief Minister Mayawati said here today that she was in favour of providing reservation to minority community like Muslims and Christians (on the basis of religion) and demanded amendment in the Constitution so that the deserving population from the minority community could benefit from this policy. While late Thakur Jagdev Chand’s daughter-in-law Urmil Thakur of the BJP ticket is making a determined bid to regain the Hamirpur assembly seat from sitting Congress MLA Anita Verma, Jagdev Chand’s clan is in the fray from here for the record 13th time. Unlike other states, there has been a marked difference in campaigning for the Assembly elections in Himachal Pradesh. With strict vigil being maintained by the Election Commission, there is hardly any sign of money power being used to influence the electorate. Even the glossy posters and party banners were visible at only selective places. With the BSP poised in a role of now defunct Himachal Vikas Congress (HVC) and 23 other candidates in the fray playing spoilsport, the Congress and BJP candidates, the main rivals, are locked in an interesting contest. They are fighting neck-and-neck battle to secure the “magic 1.5 per cent swing in their favour”, wooing over 6.9 lakh voters for the 10 Vidhan Sabha seats. Independent candidate Jagdish Saphia has made the electoral battle in the Thural constituency a triangular contest involving the Congress, the BJP and Saphia himself. Unlike other areas of Himachal, leaders from Punjab are proving to be major crowd-pullers in this border district of the state. Insiders attribute it to kinship between people residing across the border in the two states. The Congress today asserted that widespread rain and snow over the past 48 hours, which has virtually grounded the poll campaign of political parties, had vindicated its stand that holding election in December was not a prudent decision. BJP media in charge Rajinder Rana today alleged that the successive Congress governments had extended step-motherly treatment to the merged areas by discriminating in the allocation of funds for the construction of roads, buildings and other infrastructure. Chief electoral officer Manisha Nanda has said that advertisements of political nature would have to be certified by the certification committees before their telecast or broadcast. The BSP has sent a written complaint to the Election Commission seeking action against Chief Minister Virbhadra Singh and other Congress leaders for the use of casteist remark against it at a recent Congress rally in Kullu. Rebel BJP leader and ex-chairman of the HPTDC Rakesh Pathania, who is contesting as an Independent candidate from Nurpur assembly elections, has lodged a complaint with the police that he has been receiving threatening calls on his mobile from anonymous numbers. Normal life in the state was thrown out of gear as snow and rain continued to lash the region for the second consecutive day today. A local court of Rajpura has issued fresh non-bailable warrants (NBW) against top cop of Himachal Pradesh police Bhupinder Singh Thind, who is holding the charge of ADGP (law and order) there. The police have been asked to produce Thind in the court by December 24. A teenaged girl was killed and a boy sustained serious injuries when their Pulsar motorcycle (HP-15-4820) was hit by a tipper (HP-64-0982) at Masolkhana near Parwanoo on Kasauli road this afternoon. Eighteen passengers were injured, three of them seriously, when a private bus(HP 68 1509) coming from Dharamsala rolled into a gorge at Lilly village, near Samloti, today. A truck driver was electrocuted while unloading his vehicle in Baddi Barotiwala, about 60km from here, around 11 am today. Congress workers were disappointed as Congress chief Sonia Gandhi failed to keep come here today. The AICC chief who was to address a rally here in support of the Congress candidates from Nurpur, Jwali, Guler and Jaswan canceled her visit at the last moment, forcing senior party leaders, including Ajay Maken, Sat Mahajan, MP Chander Kumar and a couple of Congress leaders from Punjab to wait for hours. Political equations would have been positive for the Congress candidates had Sonia addressed the rally, opined political 'pundits'. An SPG team had put her route under a tight security cover. The team even inspected her air route- Pathankot-Rehan-Mandi and back with the help of an aircraft. Addressing a gathering of over 7,000, Chief Minister Virbhadra Singh felt sorry on behalf of the AICC chief, saying that Soniaji was forced to cancel her visit due to bad weather. Coming down heavily on the BJP, Virbhadra Singh alleged that its leaders were trying to divide public on a caste and religion basis. He claimed that the BJP had been creating a false propaganda on price hike. The state had witnessed allround development in the past five years. HP Congress chief Viplov Thakur alleged that corruption and unemployment were a gift of the previous BJP government. She also announced to launch the election manifesto at Dharmshala tomorrow. Those who spoke on the occasion included Sat Mahajan, Chander Kumar, besides Congress candidates Ajay Mahajan(Nurpur), Neeraj Bharti(Guler) and Sujan Singh Pathania(Jwali). People who had assembled to have a glimpse of AICC chief Sonia Gandhi started dispersing soon after coming to know that she had cancelled her visit. Minister for state foreign affairs Anand Sharma today said the BJP was playing with the sentiments of the people by announcing L. K. Adavani as its prime ministerial candidate and Prem Kumar Dhumal as the chief ministerial candidate here. It was basically a publicity stunt as Advani was a “big failure as a home minister” in the NDA government and Dhumal-led regime was corrupt and he was a failure as the Chief Minister in Himachal”. Addressing the party’s well-attended rally here, which was supposed to be addressed by UPA chairperson and Congress president Sonia Gandhi, who could not make it due to bad weather, Anand Sharma said: “Advani’s ‘shining India’ was voted out by the people. He was the deputy Prime Minister and the home minister when terrorists attacked Parliament and Akshardham. The then NDA government released three deadly terrorists in Gandhar that has exposed their double-face and people of the country are aware about all this”. Urging voters of the state to vote for good governance and development carried by the Virbhadra Singh government Sharma said the BJP’s plea to vote for a change had no logic as the people had already seen the “corrupt regime of Dhumal as its own ministers had levelled charges of corruption against him and the BJP MP was caught taking cash-on-camera scam”. Despite rains and chilly weather, the rally received good crowd from Mandi-Kullu (Banjar), as they had come to hear Sonia Gandhi. It was quite a day for thousands of BJP supporters who braved rain and snow to attend the election rally of their party president Rajnath Singh here today. It was another matter that Rajnath Singh missed his date, though he did not fail to address his supporters in a novel way. With these words, Rajnath signed off, leaving the gathering awestruck. For them, it was a truly unique experience only technology could have offered. Not that they were unhappy when Rajnath Singh had not marked his presence at the rally. They were busy enjoying the oration of Daya Shankar, a veteran BJP leader from UP, famous as Mini Atal due to a similarity between his and his mentor’s oration style. He spoke with confidence about the neglected infrastructure of the area and stressed the need for trying another government. Accompanying Shankar was former Uttaranchal Chief Minister Bhagat Singh Koshiari. The main contest in Shillai is between sitting MLA Harsh Vardhan(Cong) and Baldev Tomar(BJP. Raksha Negi (BSP) and Amar Singh(Ind) can considerably impact poll results by eating into their vote-banks. Accusing the UPA of being soft on terrorism BJP chief Rajnath Singh said today that the Centre had failed to effectively tackle the problem solely because it viewed militants through communal glasses. Addressing a press conference here today he said the internal security of the country had been jeopardised as the UPA regime feared that strong action against militants and terrorist outfits would annoy the particular community they belonged to. It was a flawed approach as a terrorist did not belong to any community or religion and he was in the business of spreading terror through subversive activities. Not only that pursuing worst kind of vote-bank politics the UPA government scrapped POTA without providing an alternative law to deal with terrorism. The step had demoralised the security forces and emboldened the militants. It was hardly surprising that the security forces had not been able to nab militants involved in various bomb blasts and other incidents. In contrast during the NDA regime all those who were involved in the attack on Parliament and the Akshardham and Raghunath temples were killed by the security forces. He said that there was a “crisis of credibility” in the country as the political parties had not been implementing the election promises. The people were losing faith in politicians as they there was a yawning gap between their words and deeds. The BJP, however, would ensure that its poll manifesto was implemented in letter and in spirit in all states where it came to power. He would personally review the performance of every BJP government after one year and ensure that promises were implemented in a time-bound manner. Referring to the Ramsetu project he said the UPA government was negating the very existence of Lord Rama and it if it was so then why Mahatma Gandhi came out with a vision of Ram Rajya, why he chanted “Raghpati Raghav Raja Ram” and said “Hai Ram” when he was shot ? he asked. The government lacked the diplomatic skills to handle the foreign affairs and cited the example of activities of China along the North-Eastern border. China had laid claim on Arunachal but the UPA government even failed to lodge a strong protest in the matter. The BSP leader was addressing an election rally at Sundernagar in Mandi district and in spite of the bad weather she managed to come on a helicopter though she was late by more than two hours. The strength of the rally was quite impressive and disciplined. She allured the voters of the state with the promise that if the BSP was voted to power in the state, the upper caste would be given 10 per cent reservation in the government and the private sector as she had done in UP. She said both the Congress and the BJP governments had not taken any step to solve the problems of farmers, labourers and common man and their problems were increased during the tenure of these parties as they had been enacting the policies in favour of industrialists but ignored the common man. She said the BSP was a party of common man and it came to power with the help of common man and was forming policies in favour of common man. She said in UP many schemes for development were going on by which the common masses were benefiting and further appealed that if voted to power the BSP will initiate such schemes in HP too. Satish Chander Mishra, national general secretary of the BSP and Rajya Sabha MP said the BSP was a party of all castes. Man Singh Manehra, general secretary of the BSP and other state leaders were also present in the rally. DHARAMSALA: Mayawati today failed to attract a huge crowd in Dharamsala as per the party expectations, it may have been due to inclement weather conditions, but, anyhow she managed to convey to her political opponents that her party had already made inroads in the hill state. The scanty turnout was a clear indication that the chief ministerial candidate of the party Major Vijay Singh Mankotia, who was fighting the election from here was in trouble and might have to face one of the toughest battles in his political career. Surprisingly, none of the major political leaders from established parties like the Congress or the BJP switched loyalty to join hands with her as was being expected by the political analysts. Otherwise, it had almost become a trend in the BSP rallies to rope in political leaders of other parties in their fold. She appealed the hill folk to vote for a change and strengthen the hands of Mankotia in forming the new government in the state. Earlier, Mankotia while seeking votes for himself from the local people had projected Mayawati as the future Prime Minister of the country. The national general secretaries of the party Satish Chand Mishra and Man Singh Manhera also addressed the gathering. Though Jagdev Chand Thakur dominated the political scene of Hamirpur district from 1972 till his death in 1993 by representing Hamirpur in the Assembly for five consecutive terms, it was his uncle Capt Kanshi Ram (retd) who had entered the election fray from here in 1952 as an Independent . Kanshi Ram lost two assembly elections in 1952 and 1957 but won on the Jana Sangh ticket in 1967. He did not contest the 1962 assembly elections, the only time when any member from the clan did not contest from Hamirpur. Jagdev Chand contested the elections from Hamirpur for the first time on the Jana Sangh ticket in 1972 but lost to Ramesh Chand Verma (Cong). He won in 1977 as the Janata Party candidate and after joining the BJP he went on to win all five assembly elections from 1982 till his death in 1993. After his death his son Narinder Thakur contested on the BJP ticket but lost to Anita Verma of the Congress in the 1994 byelection. In the next elections the BJP fielded Jagdev’s daughter-in-law Urmil Thakur, who won the seat by defeating Anita Verma. Urmil lost the 2003 elections to Anita Verma whm the former is facing again this time. On the other hand, Anita Verma, whose husband Ramesh Chand Verma had contested twice by winning in 1972 but losing in 1977, is also in the fray for the sixth term in a row. Candidates are also refraining from mudslinging, use of liquor and going in for ‘advertorials’ in newspapers. Candidates revealed that they were using less printed publicity material because of two reasons. Firstly, the poll observers were keeping a strict vigil on the expenditure being incurred by candidates. Secondly, the respective district administrations were insisting on the implementation of the Property Defacement Act. The Election Commission, through district returning officers, has issued more than 200 notices to political parties and candidates for poll code violation in the state. Many FIRs had also been registered in this connection. A senior official of the state government said the poll observers (expenditure) had drawn up a list detailing the cost to be incurred by the candidates on various items during campaigning, including the printed material, advertisements, banners, taxis etc. It meant that no candidate could show lighter bills as regards expenditure incurred on the above-mentioned campaigning requirements. Interestingly, some of the poll observers had even collected the details of the rent of election offices, taxi/auto-rickshaw fares, hotel/dhabha rates of meals etc. so that no one could misrepresent the figures of poll expenditure. An eye was also being kept on the sales of liquor through the Excise Department. Even the old warhorses like IPH minister Kaul Singh Thakur, taxation minister Rangila Ram Rao and Roop Singh (BJP), former speaker Gulab Singh Thakur (BJP) and Mahender Singh (BJP) are finding hills even steeper this time as majority of voters are silent this time. Their worries are real as Dalits have started tilting towards the BSP, not because of Mayavati’s social engineering but due to individual influence of BSP candidates, most of whom are either former leaders of the Congress or the BJP. In the 2003 elections, the HVC of Sukh Ram had got 19.68 per cent votes in 10 segments, but won just Mandi (Sadar) seat. The Congress secured 35. 32 per cent votes and won six seats while the BJP got 34.26 per cent votes and won two seats, Balh and Chachiot. The 15 Independents and others got only around 3.9 per cent votes. This time, the BJP is trying hard to secure the crucial 1.5 per cent swing in its favour to trounce the Congress as the BSP is being viewed in the role of the HVC. The Congress, on the other hand, is trying to retain its foothold in all seats or even increasing its percentage share. The BJP has projected Jai Ram as leader from Mandi to trigger the desired swing, focusing its Garjana rally here. Now the Congress has roped in UPA chairperson Sonia Gandhi, who will address a rally here tomorrow to undo BJP’s impact, if any, and retain its voatebank in Mandi, analysts say. In the Mandi (Sadar) constituency, former telecom minister and chief of the now defunct HVC Sukh Ram is approaching disillusioned voters with folded hands trying all tricks of the trade to garner support for his son Anil Sharma, who is pitted against D.D. Thakur, Congress rebel-turned-BJP candidate, and Rajindermohan, a former Dalit Congress leader-turned-BSP candidate. Another segment witnessing a keen contest is Drang, the borough of IPH minister Kaul Singh Thakur who is seeking election for the sixth term. He is facing Jawahar Thakur (BJP), an apple orchard owner from Snor valley, who began as a Congress man contested on the HVC ticket unsuccessfully. Other candidates remain small fries in the contest. BJP chief Jai Ram Thakur faces Shivlal and “united Congress men in the Chachiot segment. Presence of Jagdish Thakur (CPM) and Jagdish Reddy (BSP), both from Janjheli, is denting the votebank of both Jai Ram and Shivlal. The Congress has secured lead from Chachiot in the Lok Sabha election that had become a worrying factor for Jai Ram, said voters. Rangila Ram Rao, a Gujjar leader, is finding going tougher this time as his main BJP rival Inder Singh Thakur has been working hard this time in the Gopalpur segment. Last time, Rao managed a slender margin of 1,200 votes. Five-time winner Mahender Singh, who had changed four parties in the past and is a BJP candidate this time, is fighting a tough battle in Dharampur against the youngest first-timer Chander Sekhar of the Congress. In Jogindernagar, Gulab Singh Thakur (BJP), who had contested on the HVC and the Congress tickets in the past, is trying to wrest the seat from his nephew Surinder Paul Thakur (Congress). Rakesh Bhardwaj (BSP), Rajinder Kumar (LJP) are poised to dent both the BJP and the Congress votebanks marginally. Sundernagar, a new nerve centre in the belt, is witnessing a triangular contest among Sohanlal Thakur (Congress MLA), former forest minister Roop Singh Thakur (BJP) and a retired engineer Satya Pal Gautam (BSP), who had earlier tried for a BJP ticket. Beli Ram (Independent) is also in the fray. The Nachen reserved seat is in for a keen fight among Teg Chand Dogra (Congress MLA), Dile Ram (BJP), Roshan Lal Thukral (BSP) and Chet Ram Chauhan (SP). The BJP faces undercutting by Damodar, a BJP rebel, while the Congress faces reverses due to presence of the BSP and the SP in the fray. The victory margin was narrow last time. Balh and Korsog are witnessing close triangular contest. Parkash Chaudhary (Congress), Mahant Ram Chaudhry (BSP), Damodar (BJP) in Balh and Mast Ram (Congress) and turncoat Mansa Ram (BJP) face tough battle as BJP rebel Hira Lal (Independent), Raj Kumar (CPI) and Bhim Singh (BSP) have their pockets of influence and can dent both the main rivals. Saphia was originally a Congress man and wanted the party ticket from Thural. However, it was Sanjay Rana, a Delhi-based businessman, who was given the ticket. “We saw Rana for the first time only after he started campaigning in the constituency,” said Bipul Rana, a vegetable seller. Bipul, Hoshiar Singh of Sai Bharonta village and others assembled near Bipul’s shop would rule out that Rana was even figuring in the fight. “The contest is between Saphia and sitting MLA Ravinder Singh, BJP candidate,” they say. The sober opinion on this count, however, is that Rana is after all receiving the backing of a party, which traditionally has a votebank in the area. However, Saphia would definitely affect Rana’s votebank. The internecine clash could eventually benefit the BJP candidate. Baijnath is also witnessing a triangular contest. This is because of the fielding of a strong candidate by the BSP. Suresh Kumar Sharma of the BSP has thrown a strong challenge to the contenders from the Congress and the BJP. The sitting MLA from the constituency is Sudhir Sharma of the Congress, who is seeking re-election from the seat. The Mayawati-style social-engineering formula of combining Dalits and Brahmins could become a reality in Baijnath, courtesy the popular appeal of the party’s candidate for the seat. The only Dalit candidate put up by the BSP in the assembly segments of Palampur region is Rajgir. The seat is reserved for the Dalits. Vidya Devi, BSP contestant from Rajgir, however, was not the first choice of BSP sympathisers of this Dalit-dominated constituency. They wanted Kalyan Singh from here. The contest for the seat is, thus, slated to remain confined to traditional rivals Atma Ram, sitting MLA and BJP candidate, and his challenger Milkhi Ram Goma of the Congress. At Sulah also, the Congress and the BJP have locked horns. The main criticism of Jagjiwan Paul, sitting Congress MLA seeking re-election from the seat, is that he did not keep in touch with the voters of a large area of his constituency after he was elected. For the Palampur seat also, it is going to be a straight fight between the Congress and the BJP. Brij Behari Lal Butail, sitting MLA of the Congress, is a veteran and has won from the seat on four occasions. BJP candidate Praveen Sharma is trying to highlight Butail’s “failures” despite his long stint as an MLA. Congress MLAs from border constituencies of Punjab, including Nangal, Garshankar and Anandpur Sahib, are much sought after by candidates contesting from Una. Congress candidates from the Una and Kutlehar constituencies are pressing for the services of K.P.S. Rana, Congress MLA from Nangal. Rana is proving to be a big crowd-puller due to his impressive oratory. In the Santoshgarh constituency, Garshankar Congress MLA Luv Kumar Goldy is leaving no stone unturned for his cousin and Congress candidate from the area Mukesh Agnihotri. Many Congress candidates have requested for the services of former Chief Minister of Punjab Capt Amarinder Singh. The BJP candidates are also not far behind in requesting for the services of Punjab leaders. Navjot Singh Sidhu, BJP MP from Amritsar, is much in demand. Santoshgarh BJP candidate Jagroop Singh is requesting for the services of Punjab Chief Minister Parkash Singh Badal and Navjot Singh Sidhu. Interestingly, the candidates from the district are more keen to have Punjab leaders in their respective areas instead of national leaders, who, they say, are busy in other parts of the state. Former BJP minister Madan Mohan Mittal recently held a workers meeting at Nangal and deputed workers for campaigning in the Una and Santoshgarh constituencies. With the polling dates nearing, many of said Punjab leaders are likely to pour into the district seeking votes for candidates of their respective parties. General secretary of the party Kuldeep Rathore said the Congress had not opposed the advancement for any other reason except the weather. However, the BJP did not support the decision and indulged in the false propaganda that the Congress was afraid of elections. The real picture had emerged now and it would not be incorrect to say that it was a flawed decision to advance elections when the term of the current Vidhan Sabha was to expire on March 9. He said his party had suffered the most as both the public meetings of Sonia Gandhi to be held at Rahan in Kangra and Mandi had to be cancelled. Even the meetings of BJP chief Rajnath Singh could not take place. Rathore accused the BJP of misleading the electorate regarding the caste of Congress candidate from Rampur Nand Lal. He said he was and SC and not imposed from the top by the high command. His name was duly recommended right from the block level. Not only had the BJP levelled such charges against the Congress government but many Congress MLAs and ministers had also complained in writing to UPA chief Sonia Gandhi that Kangra was not getting its share of development funds. However, liberal funds were sanctioned for roads, buildings and water supply schemes in Kangra during BJP rule. Rana said the BJP government was committed to strengthening the “winter move” to Kangra and it would be the first step of the BJP government to hold the winter session at Vidhan Sabha Bhawan in Dharamsala. She said two certification committees were functional in the state. A state-level committee headed by additional chief electoral officer, which would entertain applications from all registered political parties, had their headquarters in the state. She said the parliamentary constituency-Level certification committee headed by the returning officers (deputy commissioners) would entertain applications from contesting candidates during elections. She said it was necessary to get proper certification for any advertisements of political nature before their telecast/broadcast . For certification, the advertisement material in a CD with its written transcript should be supplied to the committee on the proforma prescribed by the Election Commission. In her complaint, BSP president and Uttar Pradesh Chief Minister Mayawati, said the Congress leaders had used “derogatory casteist word” for her party during a rally on December 6 in Kullu. 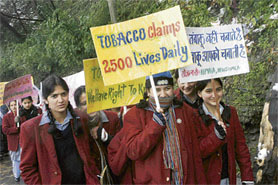 Such an act could spread hatred in the society and was against the model code of conduct, said the letter. He in his complaint alleged that he was being threatened with dire consequences if he did not retire from the poll fray. DSP Krishan Shandil confirmed that the Kangra SP had forwarded the complaint to the DSP, CID, for further investigations. He said on getting the CID report, the complainant would be rendered police protection within the next two days. Several areas of Shimla, Kinnaur, Kullu, Sirmaur were cut off as snow rendered most of the roads unfit for traffic. The Hindustan-Tibet highway was blocked at Narkanda and the Shimla-Rohru state highway at Khara Pathar. The Rampur-bound traffic was diverted through Basantpur and buses to Rohru were being plied through Vikasnagar. Narkanda had recorded 60 cm snowfall by the evening and the Hatu peak was under 3 ft of snow. Kufri and Fagu recorded 25 cm snowfall, while it was 18 cm at mount Jakhu. Churdhar wore a white mantle and the nearby resort of Chail also had mild snow. 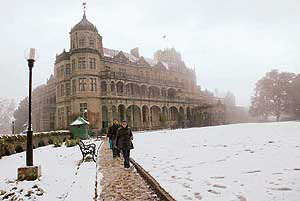 The people reeled under severe cold conditions as the minimum temperature dipped to -0.9°C and the maximum to 3.8°C. Patsio in Lahaul-Spiti was coldest with a minimum of -9°C, followed by Dhundi -4°C, Kalpa -4.5°C and Keylong -1.4°C. Dhundi had over 60 cm snowfall and Solang Nullah 50 cm, while the Rohtang Pass was under 80 cm of snow. The lower areas of the state were having widespread rain. The inclement weather forced the cancellation of election meetings of Congress president Sonia Gandhi and BJP chief Rajnath Singh. According to the local meteorological office, snow and rain will continue for another 24 hours after which there may be some respite. MANALI: The entire upper Manali region received fresh snowfall while the lower areas were lashed by rain. The snowfall, which started in the wee hours and continued throughout the day, also hampered the election campaign. Traffic on the Manali-Rohtang road remained disrupted at several places beyond Nehru kund, around 5 km from here. KULLU: The flights from Delhi to Kullu remained affected due to the bad weather for the second day today. However, the HRTC authorities claimed the operation of buses on all routes within Kullu was normal. The warrants were issued as Thind failed to appear before the court in connection with a case pending against him, in which he had been accused of fraudulently selling a prime piece of land measuring 46 canal and 6 marlas in Chaparchirdi village near Dera Bassi. The land belonged to NRI Prithpal Kaur, who had filed a complaint against the ADGP through her niece Aninder Jawanda, accusing him of selling the land that belonged to her by getting a fake general power of attorney made in his own name. The case was registered against Thind at Dera Bassi police station in November 2005 and the challan was produced in the court in January 2006. As Thind did not join the investigations, the Patiala police moved the court seeking issuance of non-bailable warrant against him. It was on June 4 last year that the court had first issued non-bailable warrant against the cop in connection with the case. However, Thind continued to elude the police teams that had gone to arrest him from Shimla. On June 23, he joined the investigations and appeared at the Patiala police headquarters where he submitted replies to over two dozen questions asked by the police. Thind was also arrested by the Central Bureau of Investigation (CBI) on October 26 last year in connection with another case of fraud registered against him and some real estate promoters. He had been accused of availing loans worth lakhs of rupees from different banks by mortgaging the same piece of property. He even had to undergo a 14-day judicial remand after being arrested by the CBI. Ekta who hailed from Pinjore was sitting as pillion rider. She died on the spot. Sandeep who hailed from Tipra village was admitted to PGI, Chandigarh. The both were returning from Kasauli. The tipper was coming from the opposite direction. The driver of the tipper has fled from the spot. A case under Sections 279, 337 and 304-A of the IPC has been registered. Kangra C.Palrasu, SDM, Kangra, who rushed to the spot soon after the accident, said the seriously injured persons, including bus driver Ram Lal, were refereed to Dr R.P. Govt Medical College Tanda, near here, while the others were admitted in CHC Nagrota Bagwan.